Peter Parker (Christopher Daniel Barnes) is in his first year at Empire State University and must juggle his studies with his part-time job as a photographer at The Daily Bugle and his crimefighting duties as Spider-Man. He also tries to squeeze in a little dating with Mary Jane Watson (Sara Ballantine) and to help out his elderly Aunt May (Linda Gray later, Julie Bennett). At work, he’s hounded by editor J. Jonah Jameson (Ed Asner) but thankfully Joseph “Robbie” Robertson (Rodney Saulsberry) is a bit more reasonable. 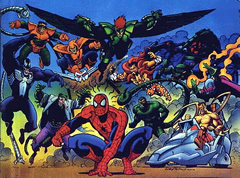 Spidey’s villains include Kingpin (Roscoe Lee Browne), Green Goblin (Neil Ross), Scorpion (Martin Landau, later Richard Moll), and Kraven the Hunter (Gregg Berger).